Needled includes crafts that have been needle felted. I made this little lion after Cecil the Lion was killed. Of course, his name is Cecil. He was made from an original concept. A magenta colored monster from my imagination. 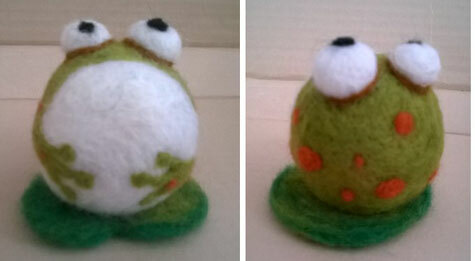 One of my first needle felted creations I was still learning the how to needle felt. This is a blue monster from my imagination. His fur is made from Lion Brand "Fun Fur" yarn abd the color is called Figi. This monster wears red tennis shoes and was a gift for my husband. His fur is Lion Brand Fun Fur. Sadly, this color is appears to have been discontinued, but it's a mixture of yellow and pales greens. His arms and legs are felted green wool over pipe cleaners. I call this one "Punk Chick" because of his little Mohawk. 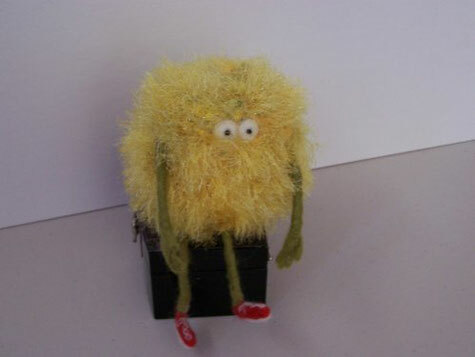 His fuzzy body was made with Bernat's Baby Soft Yarn in pale yellow. 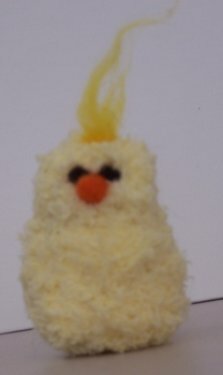 The yarn reminded me a baby chicks so I thought I would make a chick and this is the result.